These guidelines cover manuscript preparation for the Journals of the American Astronomical Society. We have recently reinstituted the AAS Style Guide developed over time by former ApJ editor S Chandrasehkar which was in place until 2008. A searchable version of this AAS Style Guide is available here. Manuscripts submitted to Research Notes should follow the specific instructions. Overleaf authors should use an AASTeX template and classfile when preparing their manuscripts. See the FAQ for more information about using these collaborative manuscript editors. Authors are strongly encouraged to prepare their manuscripts using the most recent version of the AASTeX macro package, and to submit them electronically. Detailed guidelines on the preparation of manuscripts using AASTeX is available. The journals also accept manuscripts prepared using Microsoft Word (native Word .doc/x format or Rich Text Format .rtf). There is no template for Word so authors wishing to submit a Microsoft Word document should follow the preparation instructions below. In addition, Word documents should use Courier font and 10 point size with 1.5 line spacing. 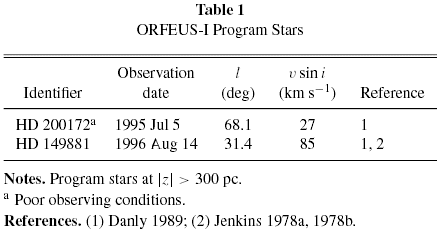 Authors should not use images for tables or equations. Articles must be written in English. Authors whose grasp of written English is not secure should obtain help from colleagues proficient in English. While a polished literary style is not demanded of scientific articles, they should conform to the elementary rules of grammar, syntax, punctuation, and clarity. Slang and jargon should be avoided. All tables and figures must be mentioned explicitly by number and appear in correct numerical order in the body of the text. That is, Tables 1, 2, 3, and 4 must each be mentioned in the text at least once, and the first mention of Table 3 should not precede the first mention of Table 2. The reference list and text citations should agree and be accurate. All text citations must appear in the reference list, and all entries listed in the reference list must be cited in the text. Acronyms and abbreviations should be spelled out the first time they are used unless they are common throughout the discipline. Terms defined in the abstract should be defined independently in the main text. Symbols for chemical elements are in normal type, not italics. The mass number precedes the symbol (e.g., 12C). Roman numeral designations for spectra of ions are given in small capitals and preceded by a space (e.g., H II). Standard three-letter abbreviations are preferred for constellation names (e.g., Cep, UMa); for a full list, see the IAU website. Object names and acronyms are spelled out in full in titles. Use standard abbreviations for SI (e.g., m, km, mm) and natural units (e.g., au, pc, cm). If English units such as inches or pounds per square inch are used, metric equivalents should follow in parentheses. Expressions of rate, such as kilometers per second, ergs per meter, etc., are set as, for example, km s-1, erg m-1, not km/s, erg/m. In tables, units should be specified in column or row heads, or explained in a footnote to the table, not given with each individual value in the table body. Right ascension and declination in text and equations are given in the form: 3h25m8s.15, 90°26’14 5″. Dates are written in the order: year, month, and day (e.g., 1996 January 1). In tables, use three-letter abbreviations for months, without a period. Universal time designations are written 22:37:48 UT (for hours, minutes, seconds). Avoid beginning sentences with a symbol, number, or lower-case letter. The word “data” is plural and takes a plural verb. Closing quotation marks follow periods and commas but precede colons and semicolons. In a series of three or more items, include a comma before the final item (e.g., “space, time, and matter”). The AAS Journals follow American usage of “that” to introduce restrictive clauses, “which” for non-restrictive clauses, and observe generally conservative grammar conventions throughout. If your article lists objects that are newly discovered, the IAU Commission 5, through its Task Group on Designations, requests that such objects be designated according to the IAU Recommendations for Nomenclature. The proper procedure is to design a name according to IAU rules and then to register it with the Commission before the article is published. Please be sure that any object that might have been named in the past is not now given a new, redundant, name. With publication charges now based on digital quanta, it is no longer required to place figures and tables at the ends of manuscripts. This style was necessary when figures were sized and tables counted to estimate page lengths. As described in Vishniac & Rasio (2014), the Journals have moved fully online. Now authors are encouraged to integrate figures and tables within the flow of text. Authors may submit manuscripts formatted with a more compact publication style. A short title (not more than 44 characters) to be used as the running head. Name(s) of the author(s), with correct capitalization and diacritical marks. The consistent use of first and middle names and/or initials from article to article is recommended. Authors who wish to identify themselves with Chinese, Japanese, or Korean characters may do so; see the Author Names in non-Roman alphabets instructions. Note that if you use AASTeX the peer review system can automatically extract out the author list provided that you use one \author command for each author. This can be a big time saver for large collaboration manuscripts. One complete postal address for each author, including zip or country code. A current e-mail address, if available, should be provided for the corresponding author. Affiliations should be listed under authors’ names. Footnotes to the title and to authors’ names as needed. The abstract should summarize concisely the content and conclusions of the article. The abstract should be a single paragraph of not more than 250 words. AAS Journals will collect a limited set of terms from the Unified Astronomy Thesaurus [link] that will help to make contextual links between your article and other articles. A maximum of six subject keywords should be listed, in alphabetical order, after the abstract. Sections should be numbered with Arabic numerals. Subsections (second-level headings) should be numbered 1.1, 1.2., 1.3., etc. ; third- and fourth-level headings should be numbered 1.2.1., etc., and 1.2.1.1., etc. First-level titles (e.g. SECTION 1) and Appendix titles should all be in capital letters; the titles of second-, third-, and fourth-level sections (e.g. Section 1.1, Section 1.1.1., Section 1.1.1.1., etc.) should capitalize on the first letter of each word, except for articles, conjunctions, and prepositions. Extensive use of footnotes is discouraged. Footnotes should be confined to providing URLs, affiliations, or other truly peripheral information, and should not be used for discussions of, or expansions on, the text. Text footnotes should be numbered consecutively, starting with those on the title page. Footnotes to tables should be designated by lower-case letters, in alphabetical order, starting with “a” in each table (see sample table). Each table should have its own complete set of footnotes, even if some or all of the footnotes are repeated in other tables. At the end of the article, individuals, institutions, and tools, catalogs or other data sources, or funding agencies may be acknowledged. Consider all possible sources of support for your work since acknowledgment sections are often searched by observatories or funding agencies to track data and funding impacts. Consult observatory and data archive websites for standardized acknowledgments; community wiki (e.g., AstroBetter) or interactive tools (e.g., The (Astronomy) Acknowledgment Generator) may also provide useful, up to date statements. Authors may also acknowledge the referee(s) if they wish; however, as the identity of a referee is usually unknown to the authors, an acknowledgment should be worded in a gender-neutral manner. It is not appropriate to acknowledge editors or journal staff. For convenience of citation of equations, authors should number all displayed equations. Plain sequential numbering through the manuscript is preferred, with Appendix equations numbered as, for instance, (A79), or starting a new sequence with (A1). Authors should ensure that mathematical notation is clear, distinct, and consistent throughout the manuscript. Care should be taken to distinguish between l (el) and 1 (one); O (capital oh), o (lower-case oh), and 0 (zero); ε (epsilon), ɛ (curly epsilon), and ∈ (the symbol for set membership); v (italic vee) and ν (Greek nu); k (italic kay) and κ (Greek kappa); and φ (Greek phi) and ∅ (the symbol for the empty set). Explicit multiplication signs (dots or crosses) are omitted, except for scientific notation, grids, vector operators, and when a multiplication wraps to a following line. Vectors are normally distinguished by bold italic type (e.g., B); arrows over symbols are not used to denote vectors. Vector operations and operators (e.g., ×, ·, ∇) are also set bold. Multi-dimensional vectors (n-vectors) are generally set italic (not bold). Tensors may be set bold non-italic if it is necessary to distinguish them from vectors. 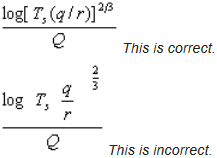 If you have certain mathematical conventions that you wish to be observed in the typesetting of your article (such as distinct fonts to distinguish 3- and 4-vectors, tensors, vector components, etc. ), please alert the copyeditor to these in an accompanying note or comment. If other fonts are needed to distinguish functions or other operators from italic (R), script (calligraphic) characters (ℛ) are preferred; blackboard (ℝ), sans serif (R), and Fraktur (ℜ) should be avoided if possible. Named functions or numbers are preferably designated by two-letter abbreviations (e.g., Ra for Raleigh number). Values given in scientific notation should be expressed with a multiplication sign preceding the power of 10 (e.g., 3.4×10-18); in tables only, to conserve space, the form 3.4E-18 may be used. These will be set aligned unless an order of subscripts and superscripts is explicitly requested by the author in a note accompanying the manuscript. If a specific sequence of subscripts and superscripts is required (e.g., Rhijk or Rjkhi), authors should indicate the correct sequence by a comment in the electronic file at the first occurrence. Single-letter subscripts and indexes referring to variables are conventionally set in italic, but subscripts standing for proper names (E for Einstein), chemical elements (H), or abbreviations of words with two or more letters (eff) are set in roman. Equations are read as part of the flow of a sentence and are punctuated as such. References should be cited in text by the last name of the author(s) and the date of publication (Hale 1929). A complete set of instructions and examples are provided. The most up to date BibTeX style file is found bundled with AASTeX 6. Tables should be numbered consecutively with Arabic numerals and should be cited in the text by number (e.g., “see Table 1”). Each table must be mentioned at least once in the text, and in proper numerical order. In the final article, the placement of tables will be determined by their first mention in the text. Tables should not be divided into parts,that is, related tables should be numbered separately, not given as Tables 3A and 3B. Tables in an appendix may be numbered in the same sequence as the text tables, or may begin a new sequence (e.g., Table 9 or Table A1). Every table should have a concise title (less than a sentence); more extensive descriptions or secondary information should be incorporated in a note to the table. All tables are typeset with horizontal rules only; no vertical rules are used. Tables should not contain empty rows. Each column, including the first, must have a heading. Column headings should label the entries concisely (one or two words); the first letter of each word is capitalized. Units of measurement should be given in parentheses immediately below the column headings, not listed with the data in the body of the table. To indicate the omission of an entry, ellipsis dots (…) are used. References cited in a table may be listed in full in a reference column or listed by number, either in the order in which they are listed in the column or following an alphabetical ordering of the references, with the full citation by name(s) and year in a note below the table. Alphanumeric abbreviations (e.g., SR86) may be used in place of numbers if these are used elsewhere in the text. The note to the table should then read, for example, “References. (1) Smith & Roe 1986; (2) Peebles 1993.” All references cited in tables must also have a complete entry in the reference list. Large tables are provided to readers as formatted ASCII data with a meta-data header, utilizing the same standards and styles as CDS’s VizieR tables. Please refer to our detailed instructions for creating the machine readable tables. Authors should submit all two-dimensional figures electronically as vector Encapsulated PostScript (EPS) files or Portable Document Format (PDF) files. Scalar (PNG, JPG, TIFF) formats are also acceptable, but the author should submit files with resolutions that would result in 300 DPI on the final PDF page. Such a file would have at minimum 1000 pixels of horizontal resolution. Detailed guidelines are available. Files with multiple pages are not allowed. Spelling and use of numbers and units in figures should conform to usage in the body of the text and figure legends. A ReadMe file detailing any special requests for sizing or arranging figures should accompany submission of the manuscript. Production staff will do their best to accommodate these requests. Figures should be numbered consecutively with Arabic numerals and should be cited in the text by number (e.g., “see Figure 1”). Each figure must be mentioned at least once in the text, and in proper numerical order. Each figure can span at most 3 pages in the final article PDF; longer extended figures must appear in an online-only format (see Figure Sets). In the final article, the placement of figures will be determined by their first mention in the text. Figure legends should clearly and concisely label and explain figures and parts of figures. The first sentence of each figure legend should be a descriptive phrase, omitting the initial article (the, a, an). In multi-part figures, the legends should distinguish (a), (b), (c), etc., components of the figure. Note that if parts are identified in the legend as (a), (b), (c), particularly for single figures composed of multiple panels, these letters should be clearly labeled in the figure itself. Otherwise panels should be referred to by position (top right, top left, middle, bottom, etc.). All lines (solid, dashed, dot-dashed, dash-dotted, etc.) and symbols (filled or open circles, squares, triangles, crosses, arrows, etc.) should be explained in the legend. Graphics or glyphs should not be used in figure legends. Figure sets are a way of displaying large numbers of figures without compromising the layout of the article. Authors utilize AASTeX markup to structure figure sets with titles and captions, and the figure sets appear in the HTML version of the final article as an interactive graphic. A truncated version of a figure set appears in the article’s final PDF version. AAS Journals encourage the enrichment of articles with supporting data, visualizations, and other digital materials. Supporting materials are subject to the same peer-review standards as the articles as a whole, and their inclusion should be justified on scientific grounds. The Journals also provide data services to authors, including data review, archiving data behind figures, and linking to outside repositories. A complete guide to the process of publishing data products associated with AAS Journal articles is give at our Data Guide. Errata are intended to correct errors in the original articles and should not contain updates or other new results. They should also not be written for insignificant or minor corrections such as author affiliation updates or author ordering changes. Corrections to data in machine readable tables require errata since readers need to be informed of the changes however changes to the meta-data of machine readable tables may be allowed provided they are minor in nature and do not alter context of the table. In all cases, the responsible Scientific Editor must approve each Erratum or meta-data change before it can be published, and may require that the Erratum be sent for peer review by the original referee or by an independent referee. Authors will be charged the normal publication charge for errata except if the error is the responsibility of the AAS Journals or IOP Publishing, in which case the author will not be charged. For the ApJL, the charge for publication of an erratum is $150.